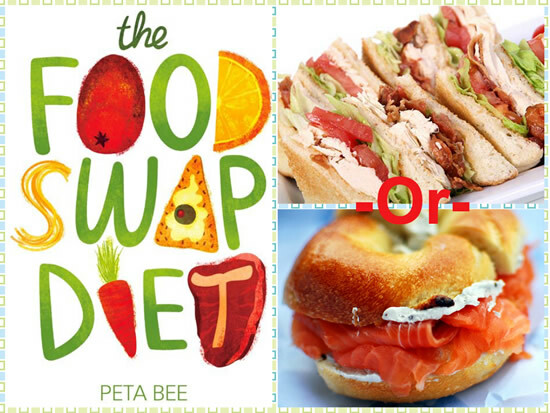 The Food Swap Diet was created by Peta Bee, an award-winning journalist with degrees in nutrition and sports science. This book is a practical manual that compares foods that appear to be similar, yet may be very different nutritionally. It helps you evaluate which of these foods are better for weight loss and health. This knowledge will assist you to make the wisest choices and easily reduce your intake of calories without strict dieting. Food swaps can help you to easily cut calories, fat, and sugar from your diet. You simply replace a less than favorable food with a similar food that is nutritionally superior. Peta Bee explains that many foods regarded as healthy may actually be a hidden source of excess calories in your diet. A yogurt dessert could contain more fat and calories than a quarter pounder. A coffee drink that appears to be low fat might contain more calories than a rich dessert. Salads can be extremely high in fat. High-fiber breakfast cereals can have more sugar than a chocolate bar. By becoming more aware of what you eat it is possible to achieve and maintain a healthy body without deprivation. This approach is different from other diets because no food is banned. You will lose weight by making educated decisions. Every meal or snack is an opportunity to make a wiser and healthier choice. You will learn to choose foods that leave you feeling satisfied so you don’t crave sugars when your energy drops. Simple changes – such as replacing white bread and pasta with whole grain products – can dramatically improve your results. On this program it isn’t necessary or recommended to cut entire food groups. You are encouraged to select a balanced diet consisting of lean proteins, plenty of vegetables and some good quality carbs. However shifting the emphasis of your meals to include a little more protein and less carbohydrates can reduce your appetite. In this book you will find hundreds of food swaps that reduce your calories by 10 to 900 per serving. Each chapter includes information on how to make healthier choices by these basic substitutions. The Food Swap Diet is easy. You simply choose the healthier lower calorie option between two apparently similar foods. Over time if you consistently choose the foods with better nutrition and less calories you will naturally lose weight. This will also lead to additional benefits including a clearer complexion, stronger immunity and protection against chronic diseases. Food swapping and exercise go hand in hand and it is easy to fit them both into a busy lifestyle. You don’t need to go to the gym. In fact being generally physically active throughout the day can actually burn more calories than a short, intense gym session. Try increasing daily activities such as walking, climbing stairs, household chores and gardening for the best weight loss results. There are more exercise ideas here. The Food Swap Diet: The No-nonsense Way to Shed Pounds retails at $19.95. Does not require elimination of any particular foods. Will appeal to dieters who prefer a flexible approach. Food Swap Diet offers an easy way to reduce calories without deprivation. Encourages the consumption of high-fiber foods and low glycemic carbohydrates. Includes information on reading food labels. Is a long-term lifestyle approach to healthy eating, which is more likely to result in lasting success. Food Swap Diet does not include a structured meal plan. Weight loss results may occur slowly, depending on the specific choices made by the individual. Since the author is from the UK some of the foods and brand names may not be common items in other countries. The Food Swap Diet is a practical weight loss manual to help you make healthier choices at every meal. Over time this approach should help you easily drop extra pounds without the need to follow a strict calorie-controlled diet.